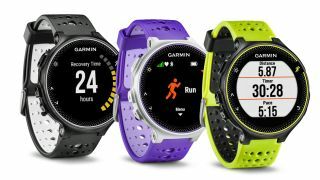 Garmin already makes several of our favourite running watches. Today it refreshed its line-up, like a sweaty man taking a shower, with the announcement of the Garmin forerunner 230, 235 and 630. Probably of most interest is the 235, which has both GPS and a heart rate monitor built in. It's £270 (about $420/AU$580 although we only have UK pricing so far) and comes in a choice of black/grey, black/marsala and frost blue/black. Like a standard fitness tracker, the Forerunner 235 does take note of your steps and sleep, tracking your daily fitness goals, but like both Garmin's other new watches, it's primarily for runners. To this end, it relays key information for runners, including your heart rate - current rate, what zone you're in (fat burn, cardio, near-death experience etc) - speed and distance covered. The data collected can then be viewed afterwards on Garmin's web platform. The Garmin Forerunner 235 also offers a VO2 max estimate - a good indicator of overall fitness that's traditionally only been possible to calculate under laboratory conditions - and recovery times, hopefully giving your body enough time to heal before you sneaker up and hit the road again. For runners wo don't mind carrying their phone on runs, the 235 also offers music controls and audio announcements of lap numbers and lap times. Furthermore, smartwatch style notifications for calls and messages are also part of the package. You'll get 'up to 16 hours of battery life in training mode and 5 weeks in watch mode' (ie: with the GPS and pulse monitor turned off) and the watch is water resistant to 50 meters. The Forerunner 230 is the same as the 235 except it lacks the built in heart rate tracker and comes in different colour combos: black/white, purple/white and yellow/black. It costs £210 (about $325/AU$450) on its own or £240 ($370/$510) when bundled with one of Garmin's external, chest-worn heart rate monitors. Last, but by no means cheapest, the Garmin Forerunner 630 is an altogether more serious device. Offering all the skills of the 230 and 235, the Forerunner 630 adds some semi-pro features and retails at £330 (about $510/AU$705) on its own, from specialist runners' stores only. You can also get a £390 ($600/AU$830) bundle with Garmin's high-performance, ANT+ HRM-Run heart rate strap. Bluetooth HR trackers are not supported. The Forerunner 630 claims to be able to help runners track everything from stride length and their bodily 'form' whilst in motion, in real time. This should theoretically help to reduce strain-based injuries. We're exhausted just reading the spec sheet.